Author(s): Alireza Farsad-Naeimi, Saeid Imani, Seyed R. Arefhosseini, Mohammad Alizadeh. Nutrition Research center, Tabriz University of Medical Sciences, Golgasht St, Tabriz, Iran. Background: Conjugated linoleic acid (CLA) is a special fatty acid in dairy products with unique antioxidant and anti-cancerous effects. Kefir, a milk product, comprises normalized homogenized cow's milk, the fructose and lactulose syrup as well as a symbiotic starter which has improved probiotic characteristics. The study was aimed to discuss patents and to examine the effect of different safflower oil concentrations on CLA content of the kefir drink prepared by low-fat milk. Material and Methods: Safflower oil was added at 0.1, 0.3 and 0.5% (V/V) to low-fat cow's milk and six formulations of kefir samples were prepared. The CLA content of the kefir products was measured at pH=6.0 and pH=6.8 by gas chromatography. Acid and bile tolerance of bacterial microenvironment in the products were also determined. Results: Substitution of natural fat content of milk with safflower oil resulted in proportional increase in the CLA contents of kefir in a dose dependent manner. The highest concentration of CLA was found under 0.5% (V/V) of safflower oil at pH 6.0 and temperature of 37°C. 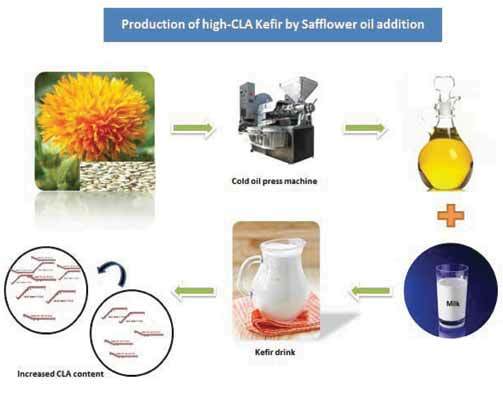 Adding the Safflower oil into milk used for kefir production, increased CLA content from 0.123 (g/100g) in pure safflower free samples to 0.322 (g/100g) in samples with 0.5% (V/V) of safflower oil. Conclusion: The current study revealed that substitution of safflower oil with natural fat of cow’s milk may help the production of kefir samples with remarkable increase in CLA content of final product. Keywords: Conjugated linoleic acid, fatty acid, kefir, live bacterial species, low-fat milk, safflower oil. Affiliation:Nutrition Research center, Tabriz University of Medical Sciences, Golgasht St, Tabriz, Iran. Keywords:Conjugated linoleic acid, fatty acid, kefir, live bacterial species, low-fat milk, safflower oil. Abstract:Background: Conjugated linoleic acid (CLA) is a special fatty acid in dairy products with unique antioxidant and anti-cancerous effects. Kefir, a milk product, comprises normalized homogenized cow's milk, the fructose and lactulose syrup as well as a symbiotic starter which has improved probiotic characteristics. The study was aimed to discuss patents and to examine the effect of different safflower oil concentrations on CLA content of the kefir drink prepared by low-fat milk.